The benefits of cloud services are limitless. Companies of all shapes and sizes, B2B and B2C, from small startups to huge businesses, are utilizing the cloud to increase their efficiency, flexibility and competitiveness. Here is an introduction to cloud for those who have just made the jump (or are about to) and are curious to know about its three main divisions, SaaS, PaaS and IaaS. Some examples of the key players within each niche. The cloud is delivering a myriad of computing services such as software, data, storage, and much more over the web, as opposed to it being physically accessible through a computer or hard drive placed in a server room in a corner of the office, which is the more traditional setup. Cloud services are continuously evolving, and while the concept was relatively nebulous at first as an umbrella term to describe off-premise IT services, it has become more defined in recent times. There are different ways you can use cloud services as a delivery model, and it may be beneficial for you to know the differences between SaaS, IaaS, and PaaS. Before diving into each of those, let’s begin with a primer on the Everything-as-a-Service (XaaS) world and how it has evolved recently. At its core, the ‘as-a-service’ model is all about finding simple and flexible solutions for users. The XaaS economy is growing at a substantial rate as more businesses, small and large, find themselves shifting their businesses towards a subscription model. But, why is it gaining so much traction? Businesses that are born in the cloud era today have a distinct advantage over more established competitors as they are able to circumvent the complexities of legacy technologies. The cloud is underscored by constant innovation, open platforms and an innate ability to provide business software users with more agility. This has, in turn, caused older businesses with technical teams to prioritize digital transformation and embrace the cloud. In conjunction, there is a higher impetus for businesses to specialize and reinvent their services. The need for companies to have scalable services and bespoke products is higher than ever before. Long-term customer retention is the key to growth for any business and many studies have shown that cloud services are the way to go. Read about Integration of Information Systems in Cloud Computing for Establishing a Long-term Profitable Customer Portfolio. There is an influx of investment in the ‘XaaS’ sector over the past 5 years, especially SaaS. The investment figures mentioned above paint a good picture of the XaaS economy as a whole in terms of its three primary constituents, but it should be noted here that recipe ingredients’ delivery, end-to-end laundry services, and shaving equipment delivery are also some examples of subscription-based businesses that are not selling any virtual products or cloud software, but are also part of the XaaS space. Many companies are already heavily invested in traditional ‘legacy’ technologies and some are observed to actively steer away from cloud-based solutions. In the current climate, this is risky as legacy services are getting costlier day by day and support for their local servers and networking equipment is diminishing. This Forbes article highlights the dangers of holding on to systems that should now be archived. This is also risky from a cybersecurity perspective as revealed in this Crozdesk infographic, which highlights how legacy systems kept in use by businesses are at risk of being attacked by hackers and crackers. Read about Cloud Computing – an Analysis of Change in Trends. So, do you know your iPaaS from your aPaaS? 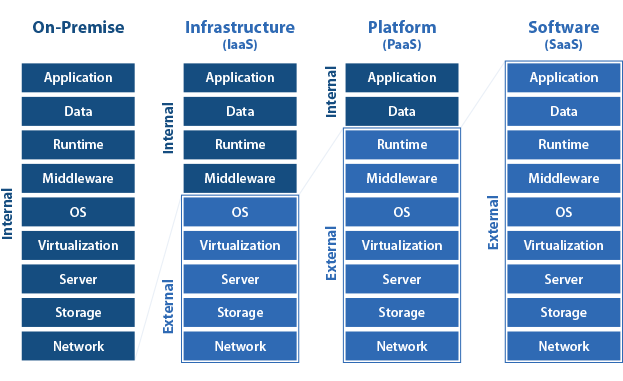 Let’s dig deeper into SaaS, PaaS and IaaS (including iPaaS and aPaaS). Bird’s eye view of the different areas covered by each service type. SaaS is the most common of these services. Applications are delivered over the internet as opposed to on-site (‘on-premise’). The software is generally hosted on the vendor’s server and is accessible through any web browser. Some common examples include Salesforce, Dropbox and G Suite. Why Would You Use SaaS? SaaS is widely renowned for its cost-cutting nature. Lofty expenses that are inherent in legacy technologies such as local installation, upgrades, and maintenance aren’t a factor with SaaS so one would not need to scramble for their wallet at every turn. In conjunction, it saves businesses a wealth of resources, as acquiring and installing a SaaS application only requires a working internet connected device. SaaS is ideal for a business that does not want to delve into the intricacies of creating and maintaining hardware and the software on it. Read in detail about the benefits of SaaS in 2017. 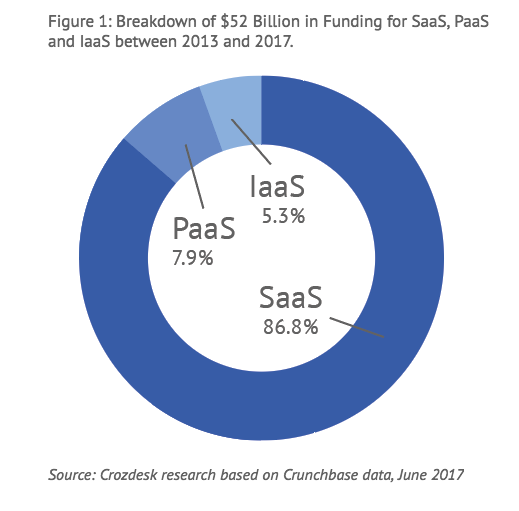 Is SaaS a Growing Sector? There has been a tremendous increase in SaaS funding in the past two years. With infrastructure and platforms already taken care of by other companies, SaaS has become a very open field giving birth to a host of startups that make this an exciting space with tremendous potential. Over $8 billion was invested in SaaS businesses in 2015, which is more than all the funding SaaS businesses ever received before 2013. The investments can be seen to grow at a staggering pace, with 2017 seeing almost $11.5 billion being pumped into almost 8,000 SaaS companies by mid-July, which is already more than the total funding in 2016. 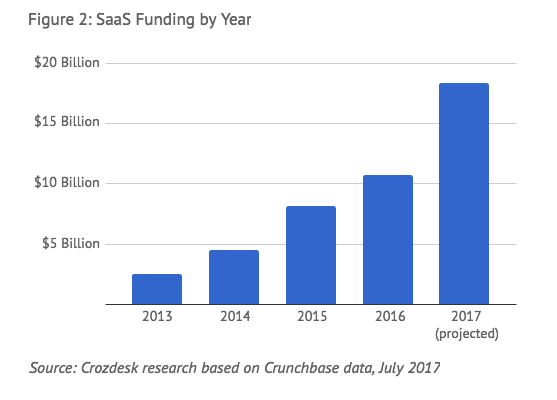 The above figure shows Crozdesk’s projection of the funding in SaaS by the end of 2017. PaaS refers to one cloud toolset that allows developers to govern services. PaaS shares the fundamentals of SaaS, but with a few important distinctions. With PaaS, users are purchasing the platform which they can use to deploy their own software and applications in a seamless and near-instantaneous manner. Why Would You Use PaaS? PaaS can increase developer productivity and a company’s agility. Traditionally, to get an application running in the cloud, developers would need to make a lot of effort configuring, downloading, and compiling the application components. This is valuable time that could be spent on improving the core product instead. Fortunately, operating systems and platform layers have evolved to make application deployment on cloud services a fairly straightforward process. This is suited for large businesses with multiple applications, or companies with multiple development teams dispersed geographically. Is PaaS a Growing Sector? 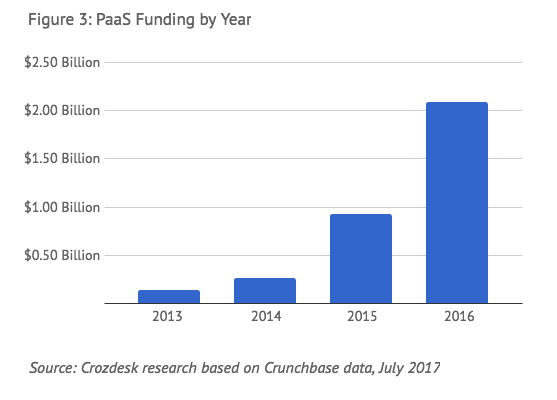 Almost mirroring SaaS funding trends, PaaS funding numbers in the figure above also show a gradual increase in investment every year, although the number of companies this data represents is only 418. Clearly, there is tremendous potential for growth of platforms as a service but it does require higher investments than SaaS to operate and innovate in this space. iPaaS enables the integration of various disparate systems and services that host data. For example, your finance system, customer service, social media manager, marketing resource and much more. It allows developers to connect information sources and consolidate the data into a single unified system that facilitates the management and sharing of inputs and outputs. This process is often aided by Electronic Data Interchange (EDI) applications. Why Would You Use iPaaS? IPaaS brings the company’s needs together in one unique cloud based toolset. iPaaS will simplify the systems operated by a business and connect platforms as services by creating a seamless integration of the systems that are being used. With iPaaS, you can increase the efficiency of your business by eliminating the need for specialized software and constant human intervention, as iPaaS will streamline the data integration between different systems. With iPaaS, users can move data seamlessly from one database to another as it doesn’t discriminate between different systems. You can use any combination of cloud-based processes, on premises, application, or service across a number of organizations. Aside from that, iPaaS affords development teams more time to deliver software, without having to build server environments simultaneously, for example, between on-premise or cloud-based services. aPaaS is a self-contained cloud environment which will enable the management, deployment, and maintenance of business applications. The customer will develop and deploy the application, but the vendor will provide the infrastructure, such as the networking, servers and data storage. With aPaaS, you are provided the tools and foundation to quickly develop and deploy applications. 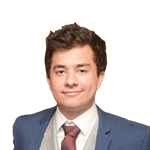 aPaaS is primarily a service which streamlines application deployment. It offers automation so that applications can be developed and deployed within minutes. This is a process that would typically take a substantial amount of time. Why Would You Use aPaaS? With aPaaS, you can rapidly deploy applications. Most service providers streamline the application deployment process, however, they do not take into account the slow nature of creating apps in the first place. aPaaS providers typically feature a myriad of handy components that make the process of app deployment a breeze. Such as, one-click deployment to public or private clouds, and collaboration tools that help teams communicate and find the right solutions to issues as they occur. In an IaaS model, a specialist third party hosts a myriad of infrastructure components, such as; servers, storage, software, hardware, system maintenance and data centers for its users. It is easy to think of this system as a metered on-demand, scalable, service, so companies can adjust their service usage according to their needs. Why Would You Use IaaS? As the service provider only provides the infrastructure, this allows the developer to maintain and create their own software and platform. This service offers a high degree of scalability, as users can scale the service, as such, it can be ideal for new and forward-thinking businesses that do not want to commit to a single application or piece of hardware. Is IaaS a Growing Sector? 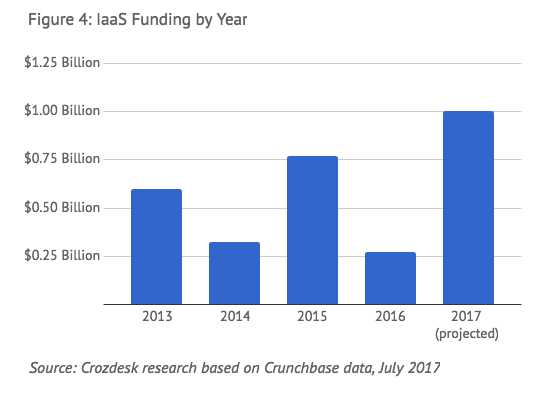 There is a clear incline in the trend line for IaaS investment. Infrastructure companies require very heavy investment, which explains the cyclical peaks in IaaS funding. The data in Figure 4 represents only 218 companies which do not include giants such as Amazon Web Services or Microsoft Azure that raise funds internally. However, the trend line does show a general rise in the money flowing into businesses offering infrastructure as a service. Growth in IaaS will trickle down to the PaaS growth and further enhance growth in the SaaS sector. Machine learning (ML), a subset of artificial intelligence (AI), has the potential to shake up the foundations of cloud computing as we know it. Cloud computing has revolutionized the way in which many businesses operate. Mass migrations to the cloud or ‘digital transformations’ are set to continue so much so that it seems to be an issue of when not if, companies will make the jump. A study by Cisco predicts that global cloud traffic will increase 3.7 fold over the next 5 years and reach up 14.1 zettabytes of yearly traffic by 2020. The ubiquitous nature of the cloud means it is ever evolving and meeting new challenges. But, how will the cloud look in a few years’ time? At its core, machine learning is a computer program’s ability to teach itself without the direct input of specific human programming. In the context of cloud services, computers will be able to analyze huge quantities of data and iteratively provide better analysis. Potentially, we could see computers building entire applications based on predictive analytics. All of the stalwart forces in cloud technology have already invested heavily in machine learning, including Google, Amazon, and IBM. Relationships are closely monitored and sought after, and a by-product of this is the rise of the algorithms-as-a-service model (AaaS). It pertains to the distribution and monetization of algorithms that are chiefly used with third-party applications. Learn about Machine Learning in more detail. Multi-cloud usage has been one of the most widely reported predictions among cloud specialists and publications. The theory is that businesses will begin to adopt strategies where they utilize the best technologies of several different cloud services in order to find the most optimal SaaS for their needs, for example. This study by the IDC predicts that “85% of enterprise IT organizations will commit to multi cloud architectures by 2018”. Suffice it to say, this could drastically alter the market, as cloud providers will have to optimize their services so that they can be interchangeably used with their competition. Hybrid cloud solutions are the utilization of private cloud, public cloud, on-premise, and third-party services simultaneously – or a subset thereof. By using the hybrid method, companies can retain full control over their private cloud, but they can also use the public cloud when it is needed. Companies typically use the public cloud for comparatively less sensitive data which also helps reduce the load on their private cloud. Read this Forrester report for more 2017 predictions. Suffice it to say, the as-a-service model has achieved a high level of maturity in 2017 and is clearly here to stay. The concept of cloud tears down financial barriers for new companies and creates a better, more flexible, user experience. The financial capital needed to set up securely is significantly less today than it was with legacy systems a few years ago. In light of this fact, and the revolutionary AI-based future that is just around the corner, now is the right time to jump into the world of cloud.